August 30, 2016 - Authenticator version 1.1.2 was released. Check the changelog, or download the update. 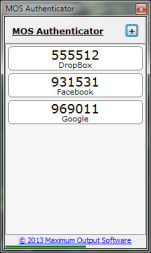 May 31, 2014 - Authenticator version 1.0.2 was released. Check the changelog, or download the update. July 9, 2013 - Authenticator version 1.0.1 has just been posted. Check the changelog. July 3, 2013 - Maximum Output Software is pleased to announce the immediate availability of MOS Authenticator, published 7/3/2013. Copyright © 2013-2016 Maximum Output Software. All Rights Reserved.